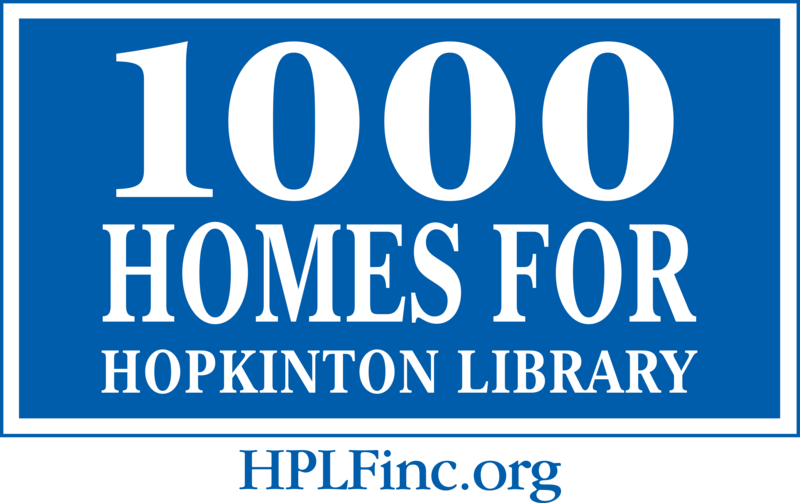 The Heritage Quilt Project raised $6,000 for the restoration, renovation and expansion of Hopkinton Public Library! Thank you to the Marathon Quilters and to all those who gave to this historic project! The Marathon Quilters are creating this beautiful and unique quilt for the Hopkinton Public Library and our community. It will look just like a shelf of books, except each book spine will display the names of the 80 businesses, community groups, families and individuals who gave to this historic project. Quilt spines are no longer available for purchase. 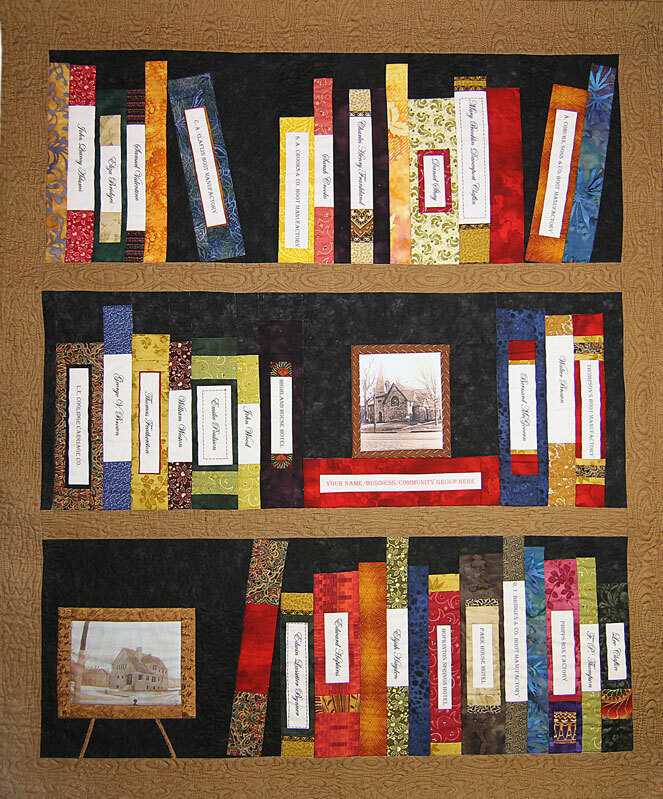 Once completed in Spring 2014, the Heritage Quilt will be displayed in our Library. Weston Nurseries of Hopkinton; Wayne and Beth Mezitt; the Burtenshaw-Johnson Family; Susan Marshall in the name of Paul Annunziata; John Warren Lodge; the Mackertich Family; Vintage Quilters in memory of Marjorie Spencer; Nancy Brigham in memory of Ernie and Ruth Chamberlain; Rebecca Brosnan in loving memory of Terry Brosnan; the Bernardo Family; Denise and Edward Kofron; Toni and Scott Alexander; the Hopkinton Public Library Staff in memory of Michael P. McLaughlin; the Barry Family; 3rd Floor Yoga – Mary Starr Green; Ruth Camille; Carol LeSuer in the name of College Rock Park; Amy Sanborn in memory of Suzanne Choquette; the Hutto Family; the Coffman Family; the Coccio Family; Alexis Miller; the Hopkinton Women’s Club; Between the Wines Book Club; the Family of Jeanette Ellsworth; Barbara Iacovelli in Memory of Lauren Janet Harper; Nia, Mike, Tom, Ben, and Nick Gallagher; Linda, Michael, Samantha and Aidan Connelly; the Beattie Family; the Book Thieves Book Club; the Culler Family; John Ferrari in the name of Peggy Ferrari; Rownak and Manzur Hussain; the Baker Fowler Family; Lisa Ambers; Stephanie Aylward in the name of Connie Hehn; Carol and David DeVeuve in the name of Gregg DeVeuve; the Alfano & Chuss Family; the Gamache’s; Isabel, Maddy & Charlotte Holden; Susan Weaver in the name of Thomas Patrick Weaver; Whitehall Farm Studios; The Casady Andrews Family; The Ianelli Family; Ann Click in Memory of Robert T. & Mary B. Nealon; Jim and Dale Danahy and Family; The Daniel Colella Family; and Doris Kumlin in the name of R “Cookie” Kumlin; friends of the Hopkinton Public Library in the name of Ken Chisholm Library Friend and Advocate; Shane, Nicole and Finnian Leavy; Tina Berlad; Kathy and Chris Barry and family; the Keeler Family; Trish Perry in the name of Wyatt and Will Iantosca; Joseph F. Irvine in Loving Memory of Doris G. Irvine and Susan L. Irvine; Faith Community Church Founded 1724; In memory of Rose Deutsch, mother of Ellen Deutsch; The Henley Family; In memory of Rachel Berube; Joe Pratt’s Farm Stand; the Losada Family; the Ahlstrom-Hall Family in memory of Jean Pidgeon; Susan Marshall; the Hopkinton Public Library in memory of David Laquidara, Library Volunteer 2007-2013; Ray and Colleen Charleston; the McDermott Family; Vishnu, Meena and Bharath Thirun; the Duckett Family; the Ajemian family; Courtney Pinnell; Dan, Liam & Skye Higgins; the Hopkinton Library Staff in honor of Jane Seaholm Children’s Room 29 Years; Susan Marshall in Memory of Clare E. Molloy, Founder of The History Book Club; The Conway Family; Shelby Simes in honor of Isabelle Simes; Hopkinton Girl Scouts; the Jennings family; Laima Whitty; Jeffrey, Stephanie and Haleigh Hodge; Mavis O’Leary; and Rep. Carolyn Dykema.